Welcome, for the first night ever, to the vaults of 2648 “La Mescla” presented by “AfroSoulBros”. The most authentic Afro Dj’s in town will put together a mix including different styles. Expect some Portuguese vibes, some Brazilian FUNK blended with Angolan DRUMS. 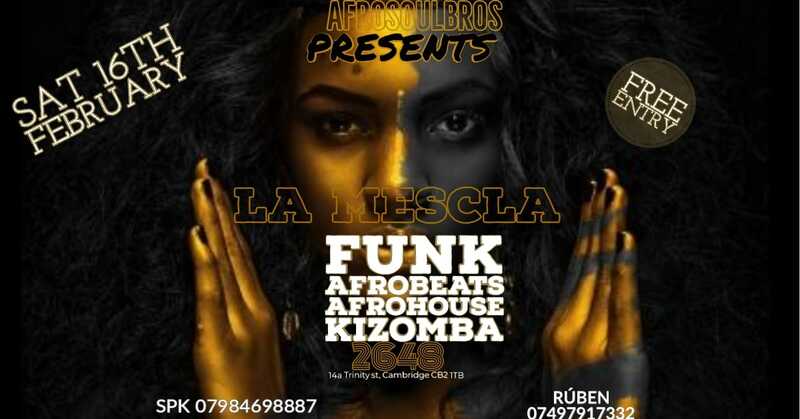 A party that will create an atmosphere and experience like no other in Cambridge. While listening to this amazing set, don’t forget to order your favourite drinks from the bar, and fill up your stomach with some of the best Caribbean nibbles in town, from Reggae Kitchen – our new pop up food. Free entry. Happy hour until 9pm. Open until 1.30am.